Zeitgeist presents a performance and casual discussion of Karlheinz Stockhausen's Gesang der Jünglinge (Song of the Youths). 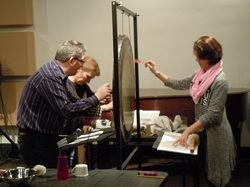 Gesang der Jünglinge integrates human voice and electronic sounds in a setting of text from The Book of Daniel. Zeitgeist will examine how Stockhausen used the technology of his time to create this masterwork and will discuss its status as a sacred work. Lowertown Listening Sessions invite curious listeners to enjoy adventurous sounds and insightful conversation with the music-makers of our time. Held at Studio Z, Zeitgeist’s performance space in Lowertown St. Paul, this monthly happy hour series brings guest artists from all genres of new music (jazz, classical, world music, folk, and more) for performances and informal discussion in an after-work setting with food and beverages from Lowertown eateries. This month's session will include pizza from Black Sheep Coal Fired Pizza. My work on the electronic composition Gesang der Jünglinge (1955/56) proceeded from the idea of bringing together into a single sound both sung notes and electronically processed ones: their speed, length, loudness, softness, density, and complexity, the width and narrowness of pitch intervals and differentiations of timbre could all be made audible exactly as I imagined them, independent of the physical limitations of any singer. The electronic sounds that had to be composed were therefore much more variegated than hither-to, since the acoustical structure of sung words is probably more complex than any other—containing as it does a wide range of vowels (sounds) and consonants (noises)—so that a fusion of all the timbres used into a single family of sound only becomes palpable when sung sounds can appear like electronic sounds, and when electronic sounds can appear like sung sounds. At certain points in the composition the sung sounds become comprehensible words, at other times they remain pure sound values, and between these extremes there are different degrees of verbal comprehensibility. Single syllables and words are taken from the Song of the Youths in the Burning Fiery Furnace (Book of Daniel, Chapter 3). Thus wherever the music’s audible signals momentarily become human speech, it is always in the praise of God. This is a new way of experiencing musical speech, but another feature of the composition is equally essential: here for the first time the direction and movement of sounds in space was shaped by the composer and made available as a new dimension in musical experience. Gesang der Jünglinge is in fact composed for five loud-speaker groups to be distributed in such a way as to surround the listener in space. Sound may issue from any side, from any number of loudspeakers at once, may move clockwise or anticlockwise, spatial distribution of sounds and sound groups is of importance in this work.